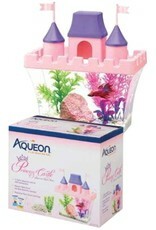 Aquaria AQ Betta Princess Castle Aquarium Kit - Rick's Pet Stores Inc. The Aqueon Betta Princess Castle Kit is an eye-catching half-gallon aquarium kit for single betta fish. These fun tanks are shaped like Princess castle turrets, and come with mountable model flags. 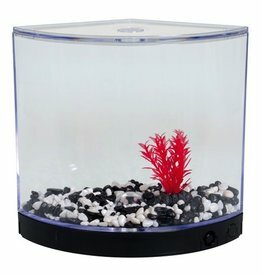 The kit includes decorative gravel, a small plant, and samples of betta food and Betta Bowl Plus water conditioner. The Aqueon Betta Castle Kit can be used for a single betta fish, or linked together with up to two other Betta Castle Kits to build your fish kingdom! Feeding holes on the top of each tank allow for easy feeding for each fish, even when interlocked. 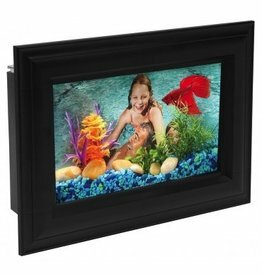 Practical, simple, and fun design make this kit a great starter aquarium for kids that's just as fun for adults! 6.125" x 6.125" x 7"